In this chapter David briefly testifies that he did not conduct himself with the kind of arrogance and egotism that are generally associated with leadership and authority. He did not pursue luxuries or exert undue control and power over the people; despite his position of monarch, he led a generally humble, subdued lifestyle, ever cognizant of his obligations to the true King over the world. David proclaims that he looked at himself not as a powerful, successful ruler, but rather as an infant sucking milk from his mother. The image of a suckling babe relates to the theme of dependence; the infant is entirely dependent upon his mother for his very survival, and without his mother's devoted care he cannot live. David lived his life with this same mindset vis-à-vis his relationship to God. Rather than take pride in his remarkable accomplishments as a warrior and leader, he attributed all his success to the Almighty. He recognized his debt of gratitude to God for even his very survival, not to mention for his successful monarchy. 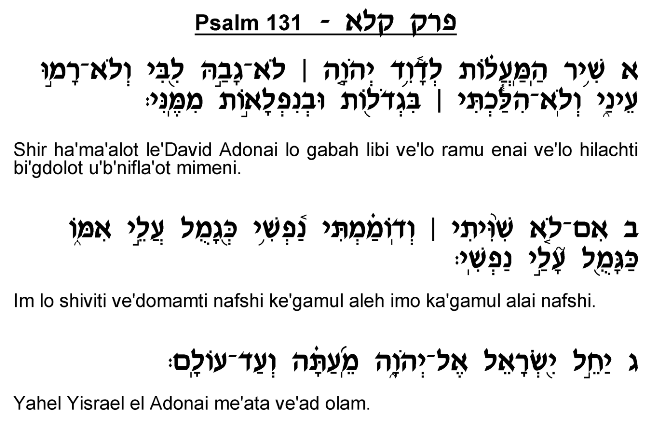 David makes this affirmation not for self-glorification, but rather in order to admonish the Jewish people to follow his example. 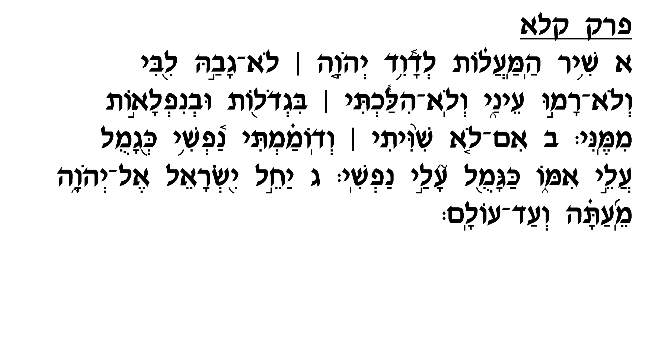 This Psalm concludes with a summons to all Am Yisrael, inviting them to constantly place their faith in the Almighty. David wishes to impress upon us that his success resulted from God's assistance, and not from his independent capabilities, and we should therefore show similar faith and devotion to God, and thereby be deserving of our final redemption.